Anja C. Andersen is an astrophysicist who studies stardust and is also a star communicator. 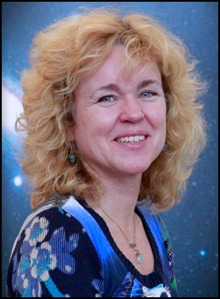 She is an associate professor at the Dark Cosmology Centre at the Niels Bohr Institute and has been awarded the 2011 Science Communication Award for her outstanding contributions to the dissemination of the faculty’s research. Anja C. Andersen is an associate professor at the Dark Cosmology Centre at the Niels Bohr Institute and has been awarded the 2011 Science Communication Award. “It is really cool to get an award from your workplace. It means a lot to be seen and feel that you are recognized by colleagues and directors for the work you do,” says Anja Andersen, who believes that it is important to tell the world and young people in particular about exciting new research. Anja Andersen is an eminent speaker who really knows how to talk about her material in an engaging way that captivates the audience. This has led to numerous communication awards, including the Rosenkjær Prize from the Danish Broadcasting Corporation in 2006 after which there was even more demand for her as a lecturer, but she has chosen to prioritise schools and colleges, where, with recruiting in mind, she can tell about the exciting universe of astronomy. Her lectures are never the same, but are based on the newest discoveries and the latest cutting edge research. Her interest in astronomy was sparked when she was in the 7th grade and Uffe Gråe Jørgensen came and told them about astronomy. She went straight home to her parents and proclaimed that she wanted to be an astronomer. That she did and is now colleagues with Uffe Gråe. Anja Andersen studies cosmic dust and how the dust accumulates and forms new stars and galaxies. “I am probably a somewhat atypical astronomer, because I am in the laboratory much of the times studying the chemical composition of meteorites in order to use that knowledge for theoretical models of how solar systems can be formed,” she says and explains that what is so exciting about research is that you are looking for answers to fundamental questions about the universe. She loves the unpredictability and the fact that nothing is a foregone conclusion – it is the quest for new discoveries that drives her as a researcher. But research is often a long and arduous process where several years can pass before you have new results and a discovery is published. “With public outreach I can use an entirely different side of myself. When you hold a lecture there is immediate feedback. There is a tangible payoff here and now if you manage to capture your audience and convey your message,” she says. And she does that – captures her audience, both as a lecturer and as an author. Anja Andersen has written five popular science books on astronomy, including two children’s books, and she is a regular contributor to Weekendavisen. In addition, she is a frequent guest on radio and television. The Science Faculty is awarding the 2011 Communication Award to Anja Andersen, who has made an extraordinary contribution to public outreach. The 25.000 DKK prize will be presented at a reception on Thursday the 5th of January at the Dark Cosmology Centre.